These versatile copper trays are ideal for grouping smaller violet, cactus or herb pots together while protecting your table or windowsill from excess moisture and soil. Fill with glass gems or stones to water plants from underneath. The copper finish will develop a natural patina over time. Available in two sizes, small is 20”L x 5”W and large is 29”L x 5”W. Made of stainless steel with Polished Copper plated finish. CLASSY HOME ACCESSORY - This long copper tray is 29 x 5 inches and has a height of about one inch. It has straight sides with a simple rolled edge, for a trendy, classic look. At this size, these are perfect trays for coffee tables and windowsills for grouping together smaller violet, cactus or herb pots. BEAUTIFULLY CRAFTED - This handmade long tray is made from stainless steel with a copper plated finish. This finish develops a natural patina over time, giving this copper decorative tray a stylish, rustic look. Your favorite decorative collection or seasonal display will look great in this decorative copper tray. CATCH PLANT DEBRIS - This large copper tray is perfect for holding plants. You can use one as a planter tray for small plants that can grow in shallow soil, or you can fill it with gravel to drain other planters. Additionally, this copper tray works great when placed underneath a cloche or a pot. Give your plants a stylish home that will keep the dirt, moisture, and fallen leaves contained. CATER FOR SPECIAL EVENTS - This long copper tray is great for serving food and beverages. If you're looking for a copper valet tray, drink tray, coffee tray, or bar tray, our large copper tray will meet your needs perfectly. Use one of these copper trays for serving food and drinks at your next social event or tea party. VERSATILE - The trendy copper finish and classic design of this long tray makes it exceptionally fashionable and functional in a variety of contexts. Indoors or outdoors, it's perfect for serving food or drinks with class. Alternatively, use it to contain a decorative display or place it beneath plants. 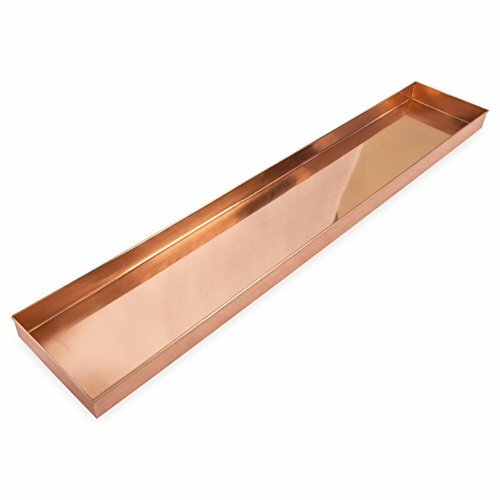 Whatever your needs, this long copper tray will do the job with finesse.